I met Patrick in Breckenridge, CO. The exact day in fact that we also became room mates with 4 other ski-bums. It was quite the introduction as everyone said a short hello and then signed a lease together. With 6 people in the house our living spaces got creative; two of the girls even used the downstairs living room as a shared bedroom! Mountain living has changed since then but that home has always been special to me. Various friends were constantly pouring in, Joe's family dinners brought us all together, and honestly it never felt too crammed. Our house was fun and the 3 girls to 3 boys kept it pretty balanced. Or maybe I'm speaking for myself haha! Anyway, Patrick was always a big brother to me and he remained so as we all said goodbye to our cozy mountain home. While room mates, Pat had started dating a beautiful blond named Kari. She was sweet and kind with a bit of Georgian sass that I loved. The two had began talking about moving to Arizona, giving up the ski life for a bit and allowing Patrick to pursue becoming a golf pro. I watched as their relationship grew deeper and eventually they found warmer weather amidst the giant Saguaro Cacti in the Arizona desert. Another old room mate and I had wanted to visit Pat and Kari for almost a year but never got the chance, so when Pat proposed (of course Kari said yes!) 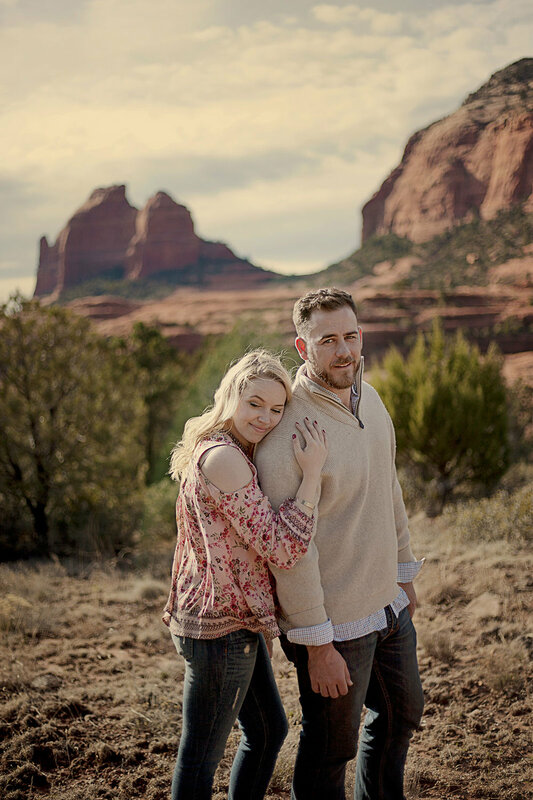 I was elated that they requested I travel to Phoenix to photograph their engagements. I arrived in Phoenix and was instantly greeted by their handsome husky pup Bowie. Bowie is a red husky with lots of love and energy! He joined us as we trekked up to Sedona, passing through the wild cactus laden landscape along the way. Sedona had such a fun Southwest culture and the most gorgeous backdrops of tall red rocks for their engagement session. After driving Pat's jeep up a long rocky 4x4 dirt road the 4 of us hiked around for several hours. Capturing their love and catching up was so much fun. Editing of course was a piece of cake as they're not only gorgeous together but they chose the most fantastic area to snap their engagements! Hope you enjoy and if you're planning a trip to Sedona, TAKE ME WITH YOU or bring me back a cactus, that'll work too.